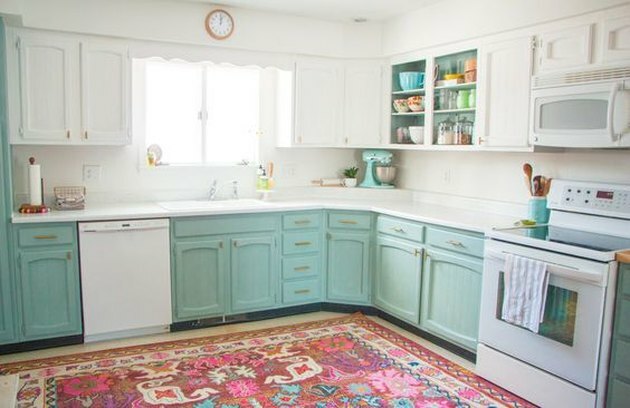 If you rent your home, then you know the issues that can come with the kitchen: linoleum countertops, generic tile, and cramped corners just scratch the surface. But just because this space isn't entirely your own doesn't mean that you have to resign yourself to its unsightly pitfalls. A few weekend projects — like installing open shelving, painting cabinetry, or adhering peel-and-stick panels — can transform your cooking space into a bright, modern kitchen. We've collected nine simple examples to help you get started. 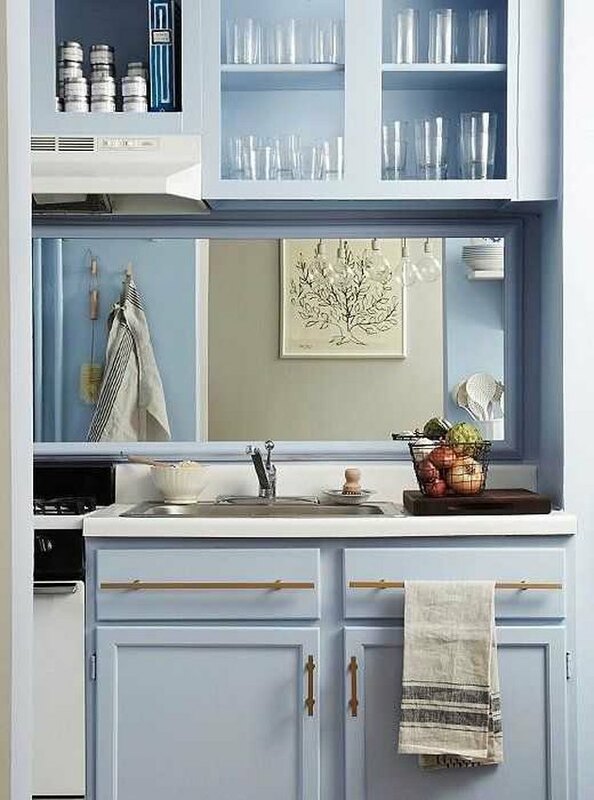 Installing shelves is a great way to gain storage in a tiny rental kitchen. Take inspiration from this space by Seeds and Stitches and choose a handful of thin shelves for a cohesive look. 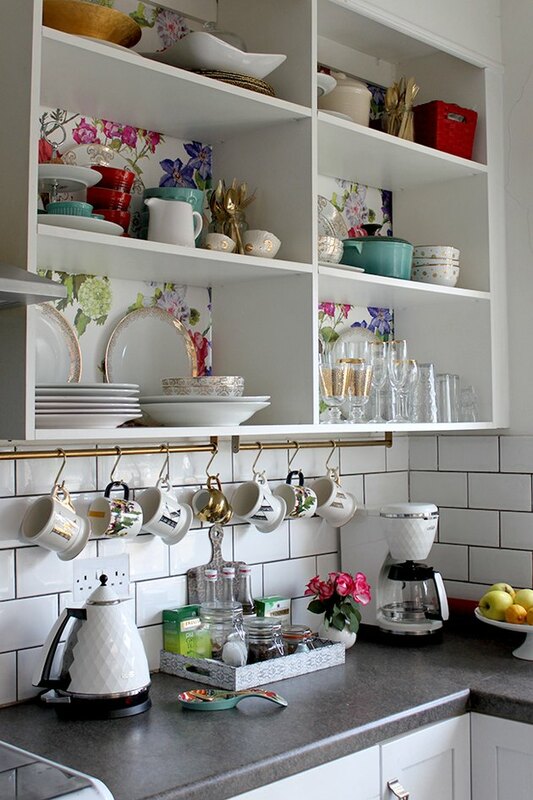 Display your collection of coffee cups on them, and you'll have more space in your cabinetry for bigger items. Give solid wood cabinets a quick refresh with a coat of paint. Go with a trendy pop of color on just the lower cabinets — like in this space by Holland and Avenue — to complement the white cabinetry above. Not only will it look great, but it'll also make the room feel taller. If you're low on counter space, a rolling cart is the perfect solution. Pick something with a butcher-block top, like this one seen on Reality Daydream, and it'll work double-duty as a functional but stylish piece that you can move around when necessary. 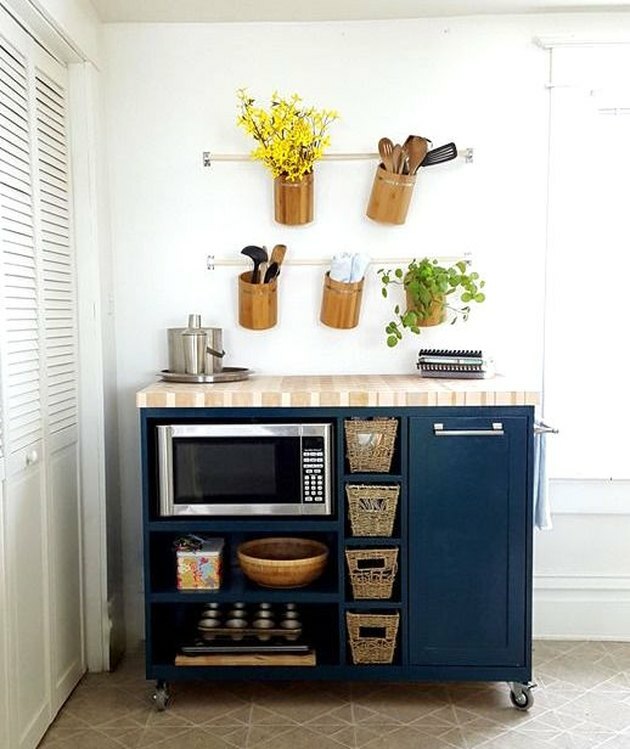 Add baskets for organization and you're all set. 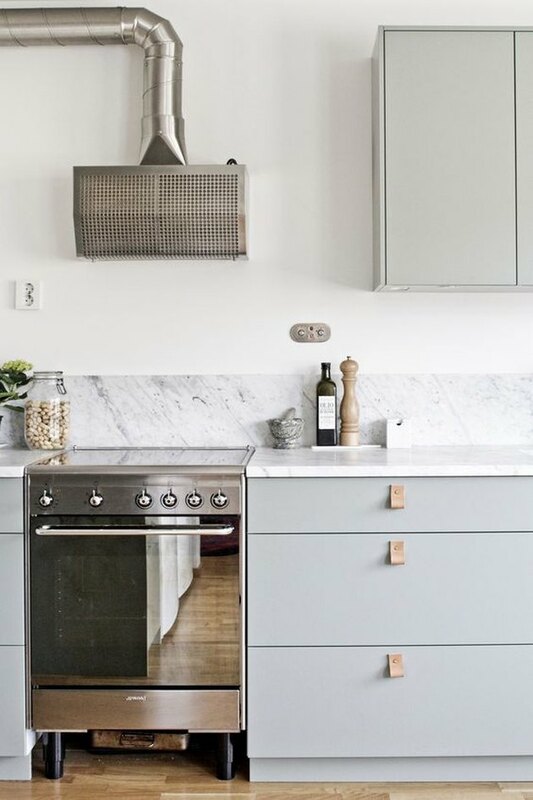 Doing something as simple as switching out the hardware on your kitchen cabinets can go a long way in giving the space an updated look — just make sure any new knobs and pulls you choose will match up with the holes that are already there. Opt for gold finishes in a minimalist kitchen, like this space by Studio McGee, for a modern makeover that has a hint of glam. If you're renting, chances are that those linoleum countertops in your kitchen aren't going anywhere. Instead of cringing every time you see them, do what Simply Grove did and use self-adhesive film for a faux marble look. You'll be able to remove it without damaging the countertop underneath, too. 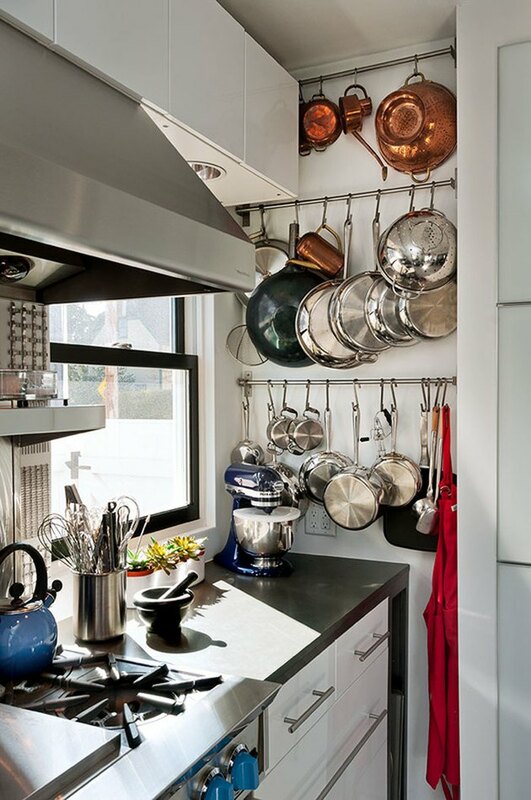 Install metal bars along a blank wall by your stove and use hooks to put your pretty pots on an easy-to-grab display. If you place the bars all the way to the ceiling, just like Patty Kennedy did, you'll capitalize on every last inch. A windowless kitchen can instantly feel brighter with the help of a strategically placed mirror. This blue dream by One Kings Lane uses a rectangular one against the backsplash to bounce light around the tiny space. Painting the frame the same color as the walls also helps the mirror blend in for a seamless look. Do you have a blank space between your cabinetry and your kitchen's entrance? 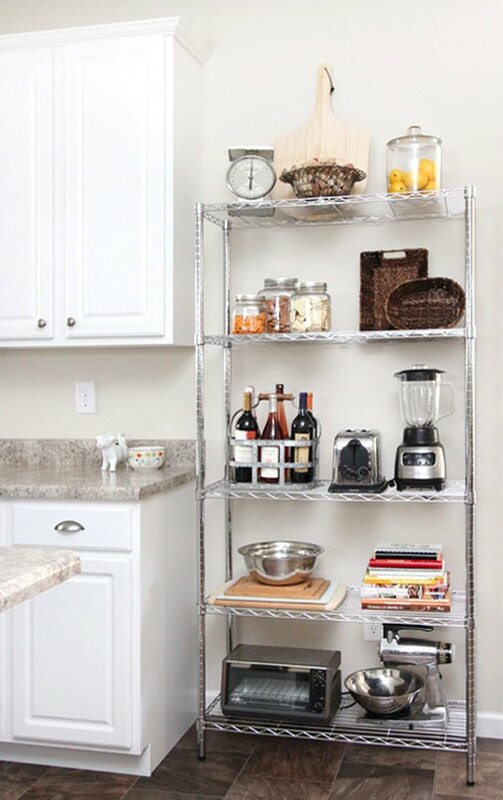 Then add a metal shelving unit akin to How to Nest for Less, and use that area to store everyday appliances. 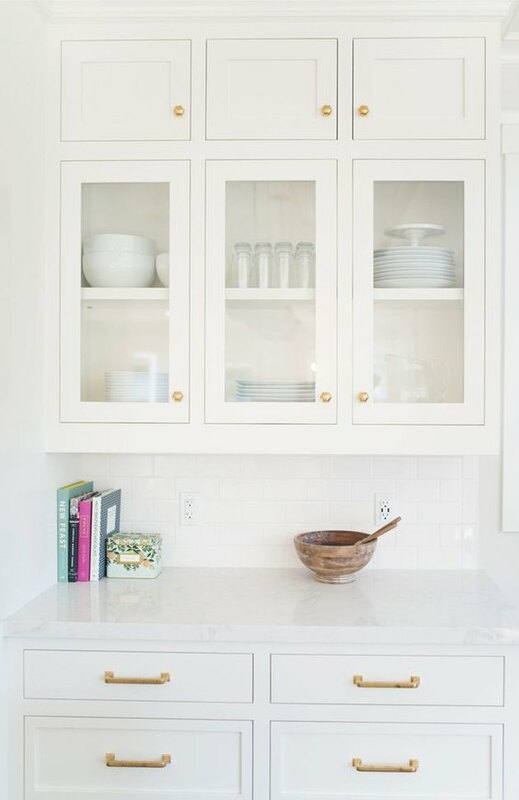 Add in a few final touches, like a stack of cookbooks or a jar full of fresh lemons, and your new shelving unit will feel like part of the decor. The space right underneath your cabinets is often overlooked, but it can come in handy when space is really tight. 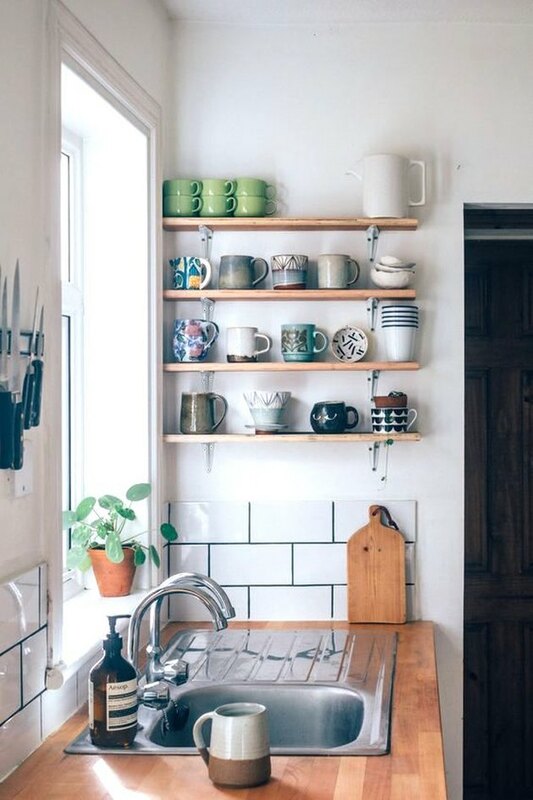 Create a countertop coffee station, a la Swoon Worthy, and install a bar to hang all of your pretty ceramic mugs. It'll look even more chic if the mugs all share the same shades.